Following the professional accreditation of the University of Redlands School of Business at the end of last year, the School has established the Omicron Theta Chapter of Delta Mu Delta. 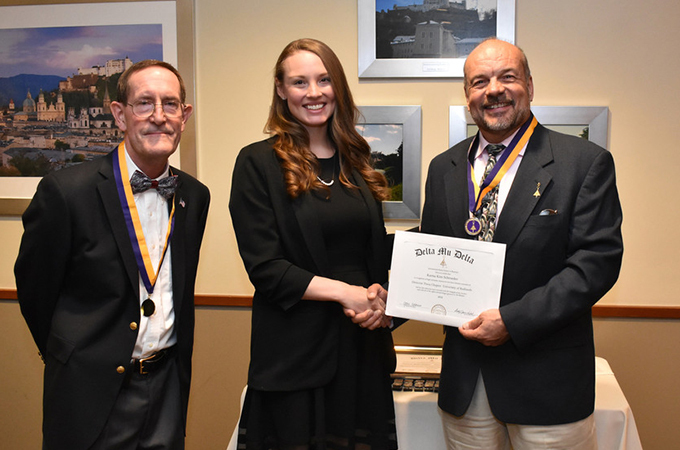 Additional students will be inducted into the society in March 2019. Membership is reserved for School of Business students who are in the top 10 percent of their class (minimum GPA of 3.50 for undergraduate and 3.75 for graduate students) and who have completed at least 75 percent of the work required for their degree. Delta Mu Delta has a distinguished history that dates back to its founding by faculty members from Harvard, Yale, and New York Universities in 1913. Today, Delta Mu Delta is closely affiliated with the Accreditation Council for Business Schools and Programs (ACBSP). Not to be confused with Greek life, which consists of the sororities and fraternities, honor societies recognize excellence among peers, often in specific fields or circumstances. See www.redlands.edu for more information on academic opportunities at the University of Redlands.